The 4th round of EU-Cuba negotiations for a framework agreement for political dialogue and cooperation was held yesterday in Brussels (16 June), making progress in the economic area, but lagging behind on the political dialogue chapter. An EU senior official told journalists that the sides had achieved a “near complete” agreement on the trade and economic issues, “very broad” agreement on the cooperation chapter, which is the biggest. But he added that the sides now had a better understanding of their respective objectives, ambitions and sensitivities in the political dialogue chapter, which will enable them to prepare for the next round, to be held shortly after the summer break. 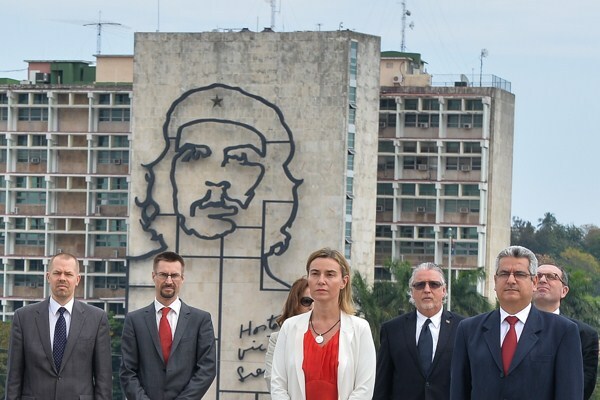 The EU and Cuba began negotiations in April 2014 year to rewrite their bilateral political agreement, part of a deepening of ties since the 28-nation bloc lifted diplomatic sanctions in 2008. In the meantime, Cuba began its sudden engagement with the United States, as the former adversaries announced in December they would restore diplomatic relations. The United States and Cuba quickly arranged high-level meetings in Havana and Washington, while EU-Cuba talks were postponed twice. EU foreign affairs chief Federica Mogherini said in March she hoped that the basics of a deal could be reached by the end of this year. In the meantime, French President François Hollande visited Cuba on 11 May and met Cuba’s 1959 revolutionary leaders Fidel and Raul Castro. Unlike some other member states, France and Spain have maintained reasonably good relations with Cuba. In January, Spain urged the EU to speed up its process of normalisation so as to not lose ground to Washington, particularly on trade. The EU official said his Cuban counterparts had been well-prepared for the talks, with a willingness to move forward. Asked what the sensitive issues were, the official said it was no secret that the EU understanding of what represents effective and accountable governance, or how fundamental rights should be interpreted and applied diverged with those of the Cuban officials. The official added that there were other sensitive issues in the technical and economic areas, areas, because those those touched on issues that are either difficult in Cuba, or in the EU. In this context, he mentioned the issue of migration. As in any agreement, there was a suspension clause, which could be triggered in case of human right violations, or the violation of non-proliferation agreements, he explained. “If we don’t obtain those, there will be no agreement," he said. According to the EU official, the EU was a very legalistic organisation and it was therefore necessary to make it clear what is the purpose of the agreement, what are the goals the sides are trying to achieve. “We have had a political dialogue which was initiated in 2008 and has met with what we might call an irregular regularity. But we have nothing much to say what that dialogue should do, should cover, should aim to achieve,” the official said. He argued that in a framework agreement, the sides could spell out much more clearly what they hope to achieve. “In my view, the dialogue should serve to inform future cooperation. We need to agree that we don’t talk to each other for the pleasure of meeting and talking. We talk to each other because we want to identify areas where we can move forward together, because we want to identify the actors with whom we can take work forward together,” he said. Asked about the timeframe for reaching a final agreement, the official said that he was aware that Federica Mogherini had stated that she hoped for an agreement by the end of the year. But, he added, it was more important to deliver a good result than a result at a given point in time. The EU suspended talks with Cuba in 2003 after Havana launched a crackdown and jailed 75 dissidents in a direct response to calls for liberalisation and greater respect for human rights. It was only in 2008 that the EU started lifting some sanctions unilaterally, the year Fidel Castro retired from the presidency permanently and power passed to his younger brother Raul.